Deer are passive, herbivorous creatures found in forests across Tamriel, where they are often hunted for their meat. They can be killed with one hit and may drop rawhide scraps upon their death. 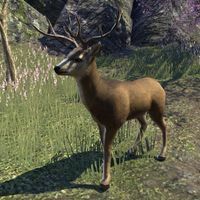 Deer were originally found in Cyrodiil, but were removed to improve performance in PvP.